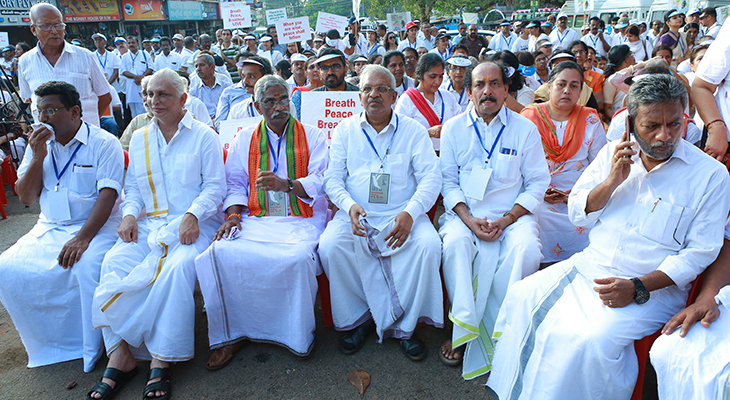 P Gopalan Kutty, Master (Kerala Secretary, RSS) Prantha Karya Vahak; P Jayarajan, Secretary, CPI(M) Kannur District; Satheesan Pacheni, President Kannur District Congress Committee; C K Padmanabhan, Former BJP President, Kerala State; Adv. 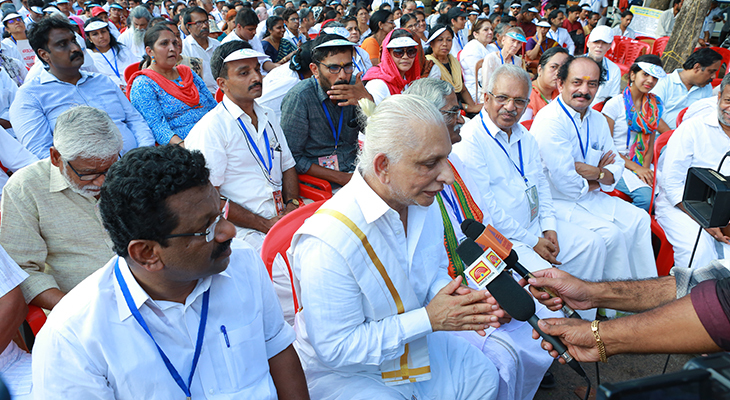 K K Balaram, RSS Prantha Sahasangh Chalak – Vice President; Jayarajan Master, RSS, Vibhag Karyavahak Kannur & Kasaragod District; P K Ragesh, Deputy Mayor, Kannur Corporation; Vellora Rajan, Standing Committee Chairman & CPI Leader; Adv. 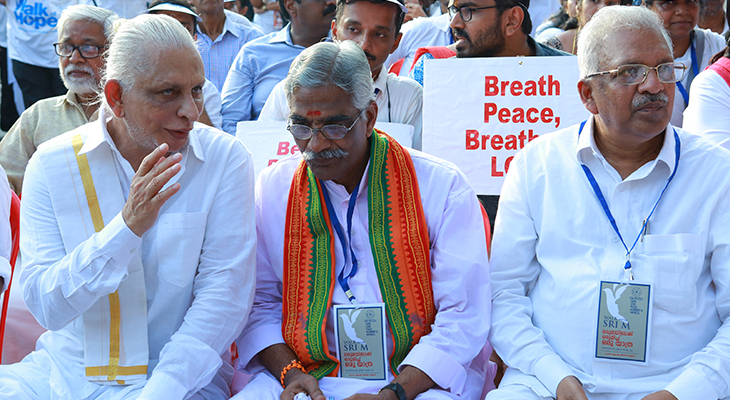 C O Mohanan, Opposition leader (Congress), Kannur Corporation; and P K Sreemathi, MP (Lok Sabha) joined the last leg of the walk. 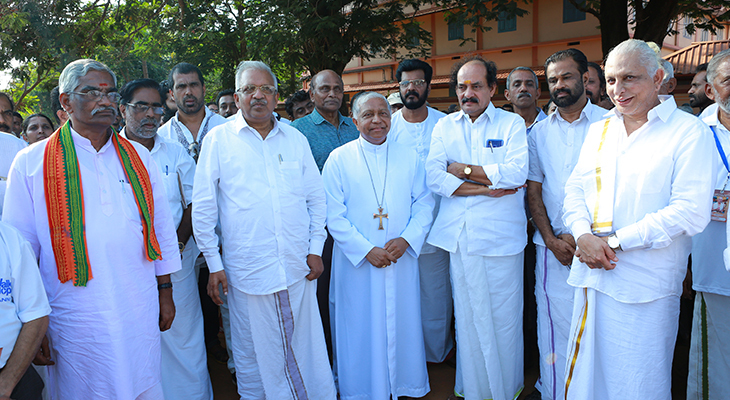 Bishop Alex Joseph Vadakumthala of Kannur Diocese flagged off the walk. 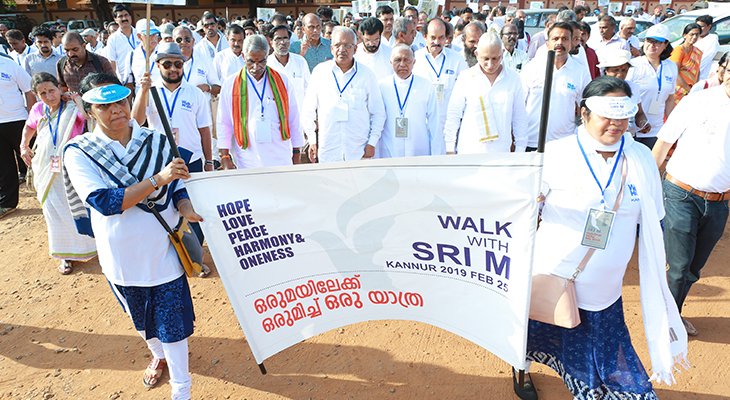 Sri M led the Walk of Hope, flanked by dignitaries wearing colours and symbols of their ideologies and religions. Around a 1000 padayatris followed him through the heart of the town – the city of looms and lores – at peak hours from 4.45 to 6.30 pm. 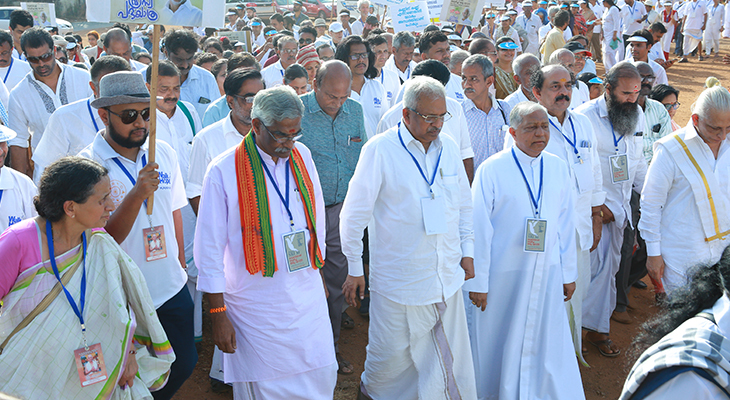 A few of them had participated in the 7500km Walk of Hope from Kanyakumari to Kashmir, while others had joined in as participants of the Satsang with Sri M at Kannur. But for many others, it was their first experience of a walk for peace and humanity. They were all following the wisdom of the ancient Indian civilization that celebrated oneness in diversity: ‘Ekam Sat Viprah Bahuda Vadanti – ‘The Truth is One but the wise call it by various names’. 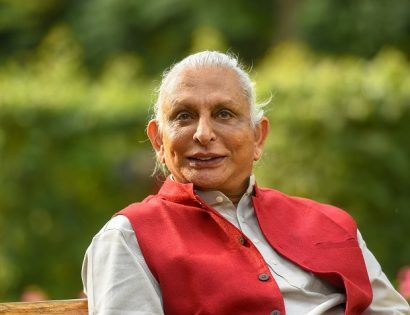 Sri M, through the Walk, wanted to convey that humanity is like an ocean with many rivers merging it in it; once these merge, they lose their identity, and one cannot identify this river or that river. 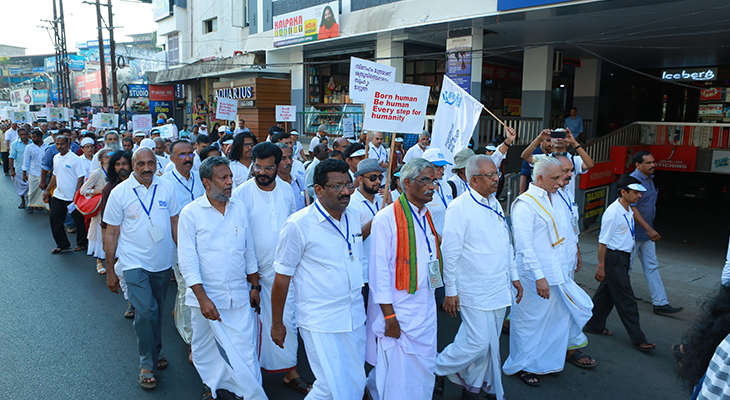 The local residents too joined the Walk, for the organisers had done a good job of spreading information about the padayatra. Bystanders watched with curiosity and, at times, even with cynical amusement for they were mostly used to gatherings motivated by the socio-political fervour. 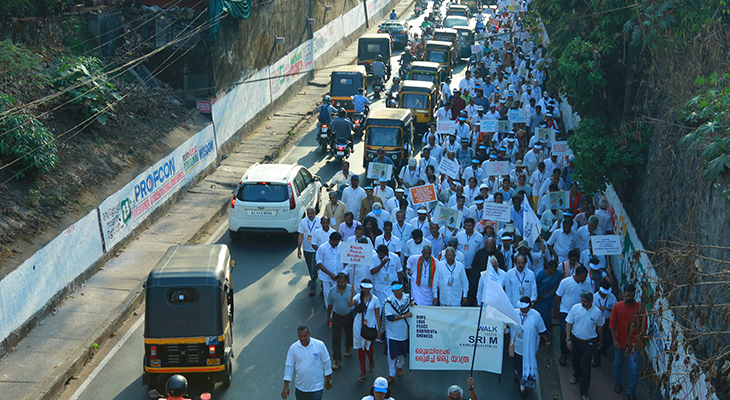 The padayatra claimed no political mileage, demanded any rights or registered any protest. The Walk reached the Town Square, near Civil Station, covering a distance of 3 kilometres. The padayatris were welcomed and Sri M was invited to share the stage with the dignitaries. 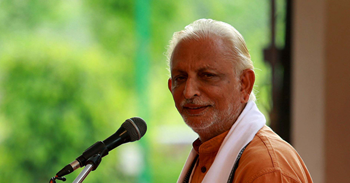 Underlining the essential oneness, Sri M in his talk pointed out that we are all going to the same place; whether it is Kabristan or Smashan, there is no difference. He asked, if we are living on this earth for such a short period, why couldn’t we live in peace and harmony? He added that life is a short drama, and questioned why we can’t live in peace without ‘himsa’ (violence)? What is happening in Kannur? 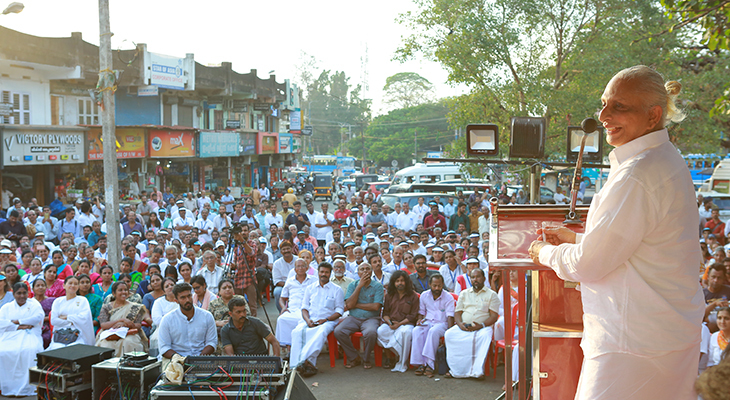 The background to this question is a history of political violence in this coastal town of Kerala, with a sizeable presence of all communities – Hindus, Muslims, Christians, with their political affiliations. The analysts attribute the violence to politics of revenge, competitiveness, and consumerism, brought in by Gulf money, unemployment, ideological intolerance etc. 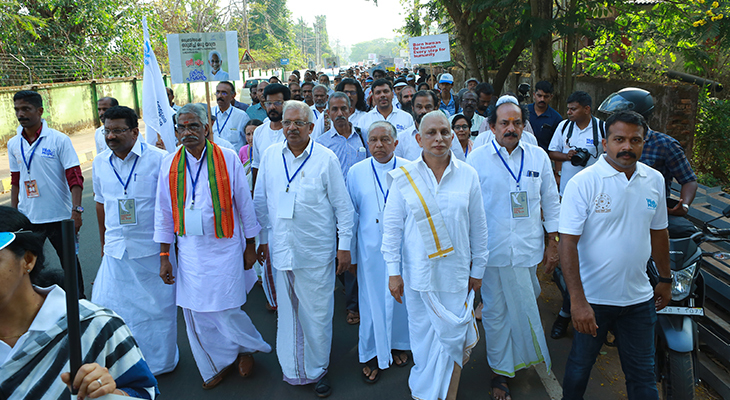 However, the Walk of Hope padayatris had not come to analyse, defend or protest but to convey the fact that one can live in peace and harmony. 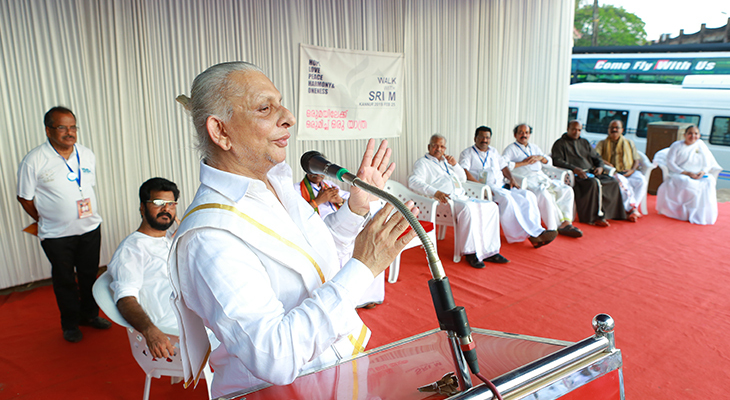 Sri M informed the padayatris that they had walked through Kannur sharing this message and he believed that the people were with him; not just the political parties but also the entire humanity. The program concluded after this brief message by Sri M.